THE HIGH POINT of the middle ages brought an unprecedented explosion of Christian ministry to those in physical distress. 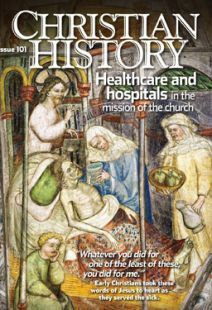 Across Europe, the twelfth and thirteenth centuries birthed hundreds of leper houses and hospitals for the sick and poor, along with hospitaller and military orders (See “Our lords the sick,” p. 31), lay confraternities (organizations dedicated to charity, mutual support, and religious devotion), monasteries, and penitential groups doing charitable work. Bishops and monks founded many of the new hospitals and sustained them with their funds and labor. But laypeople—lords, knights, and townsfolk—now also began shouldering the charitable load. The traditional “corporal mercies” (see “Did you know,” p. 3) inspired hospital donors and hospital workers to new heights of personal sacrifice. This period represented a turning point in the ways ordinary women and men thought about and acted toward their poor and needy neighbors. What did this cultural and moral change look like “on the ground,” and what caused it? One place we can see this change is in a shift in attitudes toward the poor. True, the poor continued to be stigmatized and harassed, and some beggars were suspected of being able-bodied and therefore undeserving. Yet poverty was also increasingly regarded as a sign of divine election, with the poor seen as Christ’s vicars on earth. As friars in the prominent mendicant or “begging orders”—Franciscans, Dominicans, and others—took on vows of poverty to be closer to Christ, the involuntary poor also seemed to take on a holy aura. Among other virtues, the poor provided those more fortunate with the opportunity for penitential acts of almsgiving. Lepers, too, were increasingly seen in such holy terms (see “The despised class?” p. 30). This new concern with the plight of the sick and poor shows up consistently in the testaments (wills) of the period. Among thirteenth-century testaments in Flanders, 85 percent included charitable bequests to aid lepers, hospitals, widows, and the ransoming of captives. Fourty-four percent included a bequest to at least one hospital. Similarly, in east-central France, two-thirds of all wills from c. 1300 included distributions of coin and/or food to the poor. Jacques de Vitry, who composed several model sermons directed at hospital audiences, preached the vital importance of motive in the doing of charity. Givers, he said, should not presume that their sacrifice would secure them a place in heaven. Behind this sea change in charity we may also find a powerful change in the very way people approached their religion: a “revolution in feeling” that enthroned not just charitable acts but compassionate emotions as vital Christian virtues. The most important example and teacher of ­“affective” (emotional) piety was Francis of Assisi (1181/1182–1226). His disciples preached the message of compassion from portable outdoor pulpits and within chapels whose walls were often covered with life-sized Passion scenes. They painted, with graphic, powerful language, the emotions of Jesus during his ordeal. And they urged their hearers to answer His emotions with theirs. In countless meditations, sermons, and devotional guides the medieval reader or listener was urged to imagine himself or herself present at the crucifixion, experiencing Christ’s bodily pain or feeling the grief experienced by the Virgin Mary. Magnifying the message were the painted rood-screens and crucifixes of medieval churches (and hospitals), and the scenes of the crucifixion and the Man of Sorrows in the pages of psalters, missals, and Books of Hours—all of them graphically portrayed to elicit maximum compassion and empathy from the viewer. The late medieval English laywoman-mystic Margery Kempe, known for weeping copiously (and often publicly) when she thought of Christ’s Passion, recorded many such episodes in her auto­biography. Usually her weeping went through three phases: first, she wept for Christ’s suffering; ­second, she poured out her feelings of love to Christ and sensed his love in return; and third, her feelings of devotion overflowed into compassion for other people, which motivated her to intercede for them in prayer. Toward the end of her life this sort of spirituality led her to desire to kiss lepers, care for a local woman with post-partum depression, and do other such charitable works. In the later twelfth and thirteenth centuries, to do charity was to imitate Christ. Many of the saints canonized during this period were laywomen who devoted themselves to working in hospitals for the poor and lepers. Of course, some of the saints of old had been charitable as well, but unlike most of the more contemplative saints of other periods, many of those from the late twelfth and thirteenth centuries were venerated for founding hospitals and other social welfare institutions. Another thirteenth-century lay saint known for her compassion for the suffering was Elizabeth of Hungary. After her husband’s death, Elizabeth began distributing food to the poor, washed their feet each year on Holy Thursday, made them clothes and habits for burying their dead, and founded a hospital for them at Marburg in Thuringia. Her biographers emphasized her fervor and zeal in assisting the poor. At the hospital in Marburg Elizabeth personally performed the most unpleasant, humiliating tasks, experiencing the misery of the poor herself. In short, her charity moved her to experience compassion, which was the defining feature of her spirituality. Elizabeth was only one (though a prominent one) of thousands of ordinary people who expressed the compassion they felt in their personal devotion to Christ in a robust active life of charitable service to the sick and poor. Many laypeople of this era saw working in, supporting, or (if they could afford it) founding a hospital as a way to imitate the charitable examples of Christ and the saints. Adam J. Davis is associate professor and chair (Medieval Europe) in the history department of Denison University, Granville, OH.